Early arrival option today – for those that might want to spend an extra day in the capital. Many flights from North America are night flights, so you might be arriving early Friday morning. Afternoon is free to explore the city, visit a local hot-spring complex or rest up from your trip. In the evening we will gather for a small Shabbat dinner with some local Icelandic Jews – the community is pretty tiny! At night, we have an option of checking out Reykjavik’s famed nightlife. Free morning for those already here – option of weekend activities, local-hot springs, markets, museums and more. Reykjavik, Iceland’s coastal capital is renowned for the late-night clubs and bars in its compact center. It's home to the National and Saga museums, tracing Iceland’s Viking history. The striking concrete Hallgrimskirkja church and rotating Perlan glass dome offer sweeping views of the sea and nearby hills. It is small, and pretty easy to navigate! Afternoon: Reykjavik historic walking tour. The main focus is the general history of Iceland and the evolution of Reykjavik as a town. You will also learn about elves, vikings, food, nightlife, music, economic aspects and political affairs. Finally there are the funny facts you didn‘t know about Iceland and the places you must check out. The tour is laid out in an informative and comic way, where there is also room for personal questions! Night: Group dinner and a night own on the town – it is the weekend, and you should be well rested, as nightlife here goes late in the wee hours of the morning! Today you can choose from one of the optional day trips we are offering (see What’s Included section), or stay and explore town with some of your new friends. We will regroup at night for a group dinner. Today we drive the scenic road of the south coast of Iceland to Kirkjubæjarklaustur area where we stay overnight for the next two nights. On our drive we pass e.g. Hveragerði village with its geothermal area located right in the middle of the village, visit Þingborg wool center where we learn all about the Icelandic wool used e.g. to make the Icelandic “lopapeysa” that has kept Icelanders warm in the cold winter weather. Today we visit also Dyrhóley nature reserve and the picturesque Seljalandsfoss waterfall, one we can admire from behind the plummeting water. 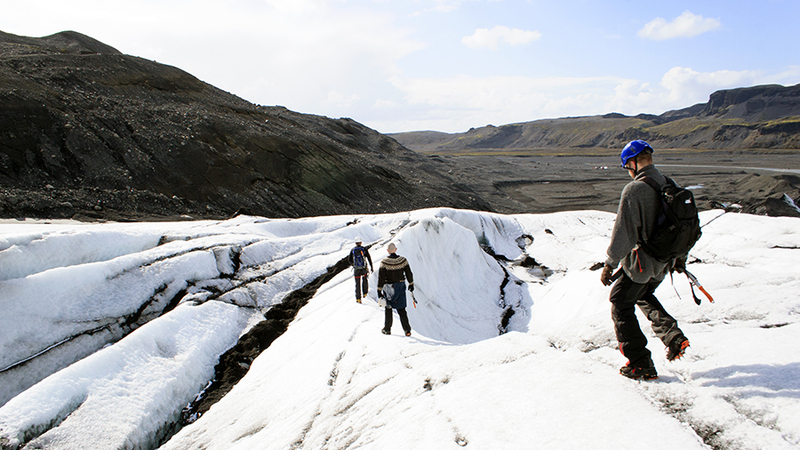 We then meet up with an experienced glacier guide with all the necessary gear to explore the wonderland of ice sculptures, water cauldrons, ridges and deep crevasses on the breathtaking Sólheimajökull glacier. Once out of town we will have many chances to see the northern lights! Today we visit Skaftafell national park where we hike to Svartifoss waterfall (e. black waterfall) surrounded by basalt columns. We then visit Jökulsárlón glacier lagoon where we sail among the towering icebergs floating on the lagoon. In the afternoon we return to our accommodation in Kirkjubæjarklaustur area. Today we explore the south coast further while we make our way to our next accommodation in Gullfoss – Geysir area. On the way we visit e.g. Reynisfjara black sand beach with basalt columns rising from the sea and the magnificent Skógafoss waterfall with its 60 meter drop. We visit Þorvaldseyri visitor centre, dedicated to the 2010 eruption in Eyjafjallajökull glacier that affected the lives of so many and learn about the hectic times and challenges met by the family farm of Þorvaldseyri. We then continue our journey to Gullfoss waterfall (e. golden waterfall) where we can walk so close to the edge we can feel mist of the glacier water on our faces. We then experience the heat of the geothermal area of Geysir while watching the thrilling display of nature‘s forces when Strokkur erupts columns of water into the air every 5-7 minutes. Tonight, after checking in, we will be a walking distance from the Secret Lagoon, a very unique bathing spot where you have the geothermal area surrounding you while relaxing in the warm water - http://www.secretlagoon.is . Today we visit the historic sites of Þingvellir national park, where the Icelandic parliament Alþingi was founded in the year930 AD. At Þingvellir we can see how the earth is ever so slowly pulling apart along the North-America and Eurasian tectonic plates. We then continue our drive toward Borgarnes village where we stay overnight. On the way we visit the family at Bjarteyjarsandur farm and learn about their way of living and taste some of their home made products. We stay overnight in Borgarnes area. Today we explore the historic Borgarfjörður district, the home of Iceland‘s most renowned writer, Snorri Sturluson (1179-1241). We visit e.g. Deildartunguhver, Europe‘s biggest hot spring, providing heat to large surrounding areas, as well as the waterfalls Hraunfossar and Barnafoss before we make our way toward Langjökull, Iceland‘s second largest glacier where we board a glacier truck transferring us to the entrance tunnel taking us deep into the glacier. As we go deeper the ice gets older and the colour changes from white to bright blue. In the afternoon we return to Reykjavík where we stay overnight for the next two nights. In the evening we will gather for a group oneg and Shabbat dinner with some local Icelandic Jews – the community is pretty tiny! Today you can choose from one of the optional day trips we are offering (see What’s Included section), or stay and explore town with some of your new friends. You have an option of weekend activities, local-hot springs, markets, museums and more. Reykjavik, Iceland’s coastal capital is renowned for the late-night clubs and bars in its compact center. It's home to the National and Saga museums, tracing Iceland’s Viking history. The striking concrete Hallgrimskirkja church and rotating Perlan glass dome offer sweeping views of the sea and nearby hills. It is small, and pretty easy to navigate! We will regroup at night for a last group dinner. Today we will have an airport transfer via the famed Blue Lagoon. Iceland's most popular attraction, the Blue Lagoon is a giant bathtub that pools six million litres of geothermal seawater from 2000 metres beneath the earth's surface. By the time it reaches the lagoon, the mineral-rich milky, aqua blue waters simmer at temperatures between 37 and 39°C. In addition to the lagoon, there's a sauna, steam bath carved out of a lava cave and a massaging waterfall. A shop, café and viewing deck keeps spectators amused. From here you will depart to the airport via an hourly shuttle, depending on the time of your departure. Most flight from the US and Canada are night flights, so you would be arriving in Iceland early in the morning. We will be providing a shuttle to the hotel. There is also an option of arriving on Sunday, October 11 and joining the group that day. You have an option of arriving on Friday and spending the weekend in Reykjavik - though we will be back in town for the second weekend as well. Your flight home can be any time on Sunday, October 18th (though if you wish you can also leave on the 17th). If you want to arrive a day or two earlier, or choose to leave later, please let us know how we can help you experience more of the Iceland - there are many day trip activities we can help you book . During our time in Iceland we will be staying in comfortable 3-4 star hotels with private facilities. The tour company we are working with in Iceland will be providing a local and knowledgeable guide for the time we explore the Icelandic countryside. The tour will also be accompanied by a Greener Travel staff person that will be with the group throughout the trip. Our itinerary involves a variety of means of travel in order to give a better feel for the particular area we are exploring. Mostly, we will be travelling by bus. Many meals are included (all breakfasts, 5 lunches, 6 dinners) Vegetarians and most special diets can be catered to with advance notice, please list any dietary restrictions or preferences on your Tour Reservation . The non-included meals are taken at local restaurants, and are paid for individually. If you are interested in the optional activities (see the What's Included page), you should reserve them in advance, as we get a special rate for booking in advance. Before departing, you will receive a comprehensive list of suggested things to bring on the Iceland trip. The month of October is characterized by falling daily high temperatures, with daily highs decreasing from 48°F to 41°F over the course of the month. Daily low temperatures range from 33°F to 39°F The weather being unpredictable, you should pack adequate rain-gear.